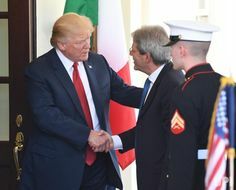 President Donald Trump welcomes Italian Prime minister to White House – Royal Times of Nigeria. Conte, who leads a coalition government between two populist parties ,the anti-establishment five-star movement and the far right league could find common ground with the President despite Mr Trump’s labelling the EU a ‘foe’. While there has been a long period of tension between the U.S and EU on matters of trade and military spending, the two leaders have been hugely complimentary of one another.